A couple of weeks a go I was invited to attend an event at my local Lush store, showcasing the amazing new Halloween and Christmas ranges. You can read all about that here. We were given some time to shop after the event and of course I couldn’t resist! I was then handed a generous goody bag which I’m so grateful for, so I thought I’d show you what I was bought/gifted! Whilst at the event we made a Bûche de Noël facial cleanser and one of the Butterbear bath bombs. We were then allowed to take these away which I was so excited for! I love the Butterbear bath bomb and have been eying up this Christmas set. I’m yet to try the Bûche de Noël facial cleanser but the smell and what’s inside it SCREAM Christmas so I’m definitely going to be giving it a go soon! Don’t Look At Me isn’t part of the Halloween or Christmas ranges but I have been lusting after it since I went to the NWMEET and we had a demonstration from Lush. I have fallen in love with this face mask as it leaves my face feeling AMAZING! It’s a really vibrant bright blue/green colour and it just makes me think of the face masks from old movies! Anyone else get that? I’d highly recommend this as I’ll definitely be re-purchasing it! I bought myself one of the Sparkly Pumpkins but was also gifted one too! I think it smells of Irn Bru which I love! I rarely drink the stuff but ended up nipping to Tesco for a bottle after craving it… send help. I’ve used this and thought it was lovely, not my favourite but I’m definitely looking forward to using the other one in my stash! Halloween-wise I was also gifted one of the small bottles of Lord of Misrule shower creme, I’m usually a sweet scent kinda gal but I fell in love with this one. It’s more of a herbal scent but definitely one I’d recommend getting your hands on if you prefer those types of scents. I couldn’t leave without picking up a Golden Wonder, Candy Mountain and Dashing Santa. All firm favourites that were out last year too. I was also gifted a Dashing Santa which made me insanely happy! One new Christmas product I had my eye on as soon as I walked into the store was Peeping Santa, he is SO cute! Not necessarily a Christmas scent as he smells very much of strawberries, but it’s definitely up my street and I was excited to put him in my basket! I’ve not used him yet as I think I may need to buy a back-up first! Two other products that were kindly gifted to me were the Santa’s Lip Scrub and Snow Cake soap. I’ve tried the other Lip Scrubs but a I’m so lazy I’d forget they were there and not use them! I love the cola scent of this one so I’m determined to combat my dry lips using this. The Snow Cake soap was a new product for me as I don’t tend to pick up the soaps from Lush. I LOVE this though, it smells like marzipan which is heavenly. It’s definitely made me consider the soaps in future! Overall, the two ranges don’t disappoint! There are some amazing new products and a lot of the oldies that we all love. In December I’m off to London for the weekend and dying to get into the Oxford Street store… SO EXCITED! What are your favourite products from the ranges? 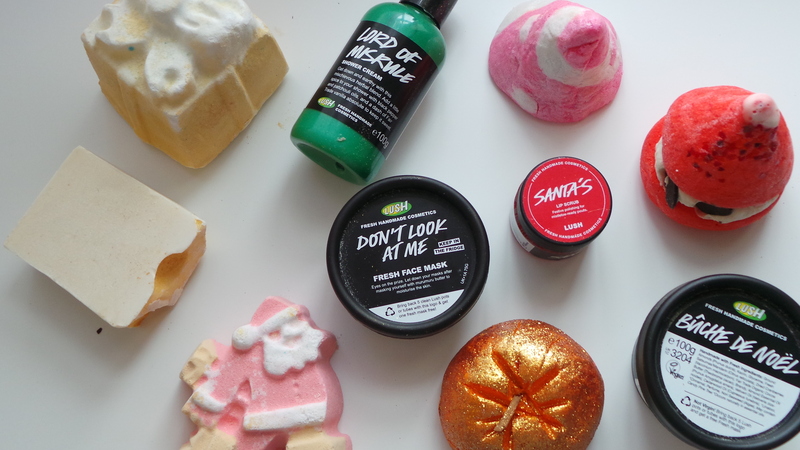 I’ve had a major lush shopping spree which I’m waiting to be delivered! I’m excited to try all the different things! I love lush soaps they’re so creamy and deeply cleansing!